Lexham is in the Breckland district of Norfolk. North of Great Dunham and south of Weasenham the parish includes the small villages of West and East Lexham. The village names have an interesting derivation coming from Old English and meaning ‘homestead of the leech’. The River Nar that runs through the parish is still home to leeches. It is more likely, however, that leech may have been a nickname, perhaps for a physician. The earliest documentary evidence for settlement in the area is two entries for Lexham in the Domesday Book. These record the presence of a church, two mills, a fishery and four beehives. 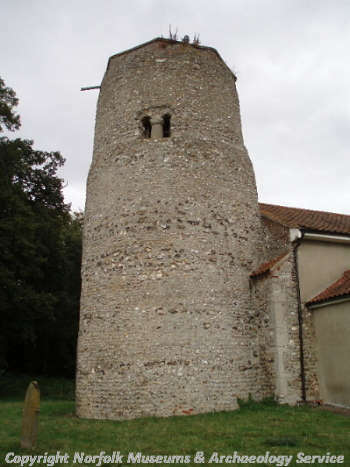 The gorgeous flint round tower of East Lexham church (NHER 4074) however is Saxon, perhaps as early as AD 900. The church of St Nicholas (NHER 4019) in neighbouring West Lexham is not much older. It is probably Saxo-Norman. Archaeological records also provide evidence of even earlier activity. The earliest recorded finds are a Palaeolithic flint side scraper (NHER 28088) and a Levallois flint flake (NHER 15719). A Mesolithic axehead (NHER 4088) has been recovered. Finds of Neolithic flints include axeheads (NHER 4016, 4073, 11449 and 14797) and leaf-shaped arrowheads (NHER 14797). Beaker period barbed and tanged flint arrowheads (NHER 4016 and 11448) have also been recovered. A Bronze Age copper alloy axehead (NHER 4017) and, more unusually, pieces of Bronze Age pottery (NHER 12541) have been recorded. A Bronze Age barrow (NHER 13546) within Lexham Hall Park (NHER 30469) is protected by English Heritage. The most recent prehistoric find is an Iron Age brooch (NHER 28740) found by a metal detectorist. There is less evidence for Roman activity. The Fen Causeway, a Roman road, (NHER 2796) runs through the parish. Cropmarks of a possible Roman temple (NHER 11348) have been identified. The interpretation of these marks is not clear though and it is possible that they are actually a medieval warrener’s (rabbit keeper’s) lodge. Coins (NHER 4018) and pottery (NHER 12067, 12075 and 4019) are further evidence of Roman activity. Lexham is well known locally for its beautiful Saxon and Saxo-Norman churches. St Andrew’s, East Lexham (NHER 4074) is the earliest. The flint tower, including its unique belfry openings carved from single pieces of stone, is completely Saxon up to the parapet. Inside there is a beautiful 20th century war memorial. St Nicholas’, West Lexham (NHER 4019) is slightly later dating to the Late Saxon or Saxo-Norman period. The nave and chancel of St Nicholas’ was rebuilt by the Victorians. Surprisingly, apart from the churches, there is very little evidence for Saxon activity. Pieces of Middle Saxon (NHER 37483) and Late Saxon pottery (NHER 15800 and 37482) have been recovered. Metal detecting recovered a Late Saxon to medieval strap fitting (NHER 28740). The medieval village of West Lexham (NHER 4063) has shrunk to its present size. The village used to surround the green to the east of St Nicholas’ Church (NHER 4019). Two medieval manors have also disappeared. The sites of Rouges Manor (NHER 4082) and Lexham Manor (NHER 13544) have been recorded in old documents. At Rouges Manor there are earthworks of the moat that once surrounded the site. A moat and several enclosures at Lexham Manor can be seen on aerial photographs. Before 1837 an interesting medieval seal matrix (NHER 14619) was found. This depicted a pierced heart and a rose and was inscribed ‘TUDER MASEN’. Lexham Hall (NHER 4089) was first built in 1660 probably around the time the manors were deserted. The building was remodelled twice in the 18th century when the present landscape park (NHER 30469) was also laid out. Parts of the walled kitchen garden (NHER 44220) date to this period. The park includes the interesting ‘Broad Water’, a canalised stretch of water leading from the lake. The lake and canal were created in the early 19th century. The more modern 20th century formal gardens of the park were designed by Dame Sylvia Crowe. Post medieval water meadows (NHER 44222) were also created in the valley of the River Nar. 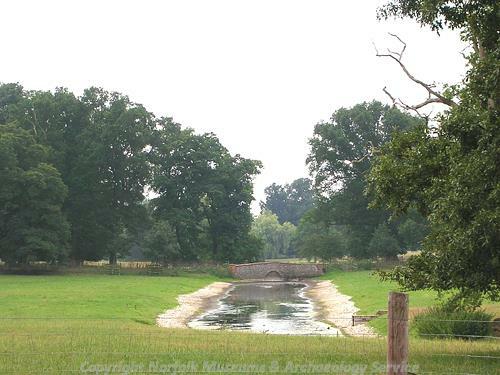 Holkham Hall Estate laid out a 10-hectare complex of channels and earthworks running 1km along the river valley between 1803 and 1811. The design won a gold award from the Board of Agriculture when it was completed. Most of the land continues to be farmed. Church Farm (NHER 13547) is a 16th to 17th century farmhouse. West Lexham Farmhouse (NHER 43952) was built around 1800. Both buildings form part of the core of an active farm surrounded by agricultural buildings. Other post medieval buildings fell into disuse and their sites are now only recorded on old maps or in documents. These include a lime kiln (NHER 23493), watermill (NHER 21656) and a windmill (NHER 16353). The most recent archaeological activity is the use of Lexham Hall (NHER 4089) by the Royal Army Service Corps during World War Two. The house was sold and restored after the war but was unfortunately burnt down in the 1950s. It was restored again in 1972. Megan Dennis (NLA), 4 April 2006.
http://www.norfolkchurches.co.uk/westlexham/westlexham.htm. Accessed: 4 April 2006.
http://www.norfolkchurches.co.uk/eastlexham/eastlexham.htm. Accessed: 4 April 2006.
http://www.roll-of-honour.com/Norfolk/EastLexham.html. Accessed: 4 April 2006.
http://www.norfolkgardens.org/garden.php?gardenID=26. Accessed: 4 April 2006.